I recently came across a great guide to communicating the value of user research to stakeholders. It seems to be written more for UX designers brought in on a contract or agency basis to help clients “do UX”. However, as a permanent developer who’s trying to “do UX” on the side, most of the points have rung just as true for me, if not more so. It can be an uphill battle trying to justify the investment required for User Research, but by keeping things simple (keeping costs low) and clearly communicating the benefit of the research, progress can be made. This was originally posted by Frauke Seewald on the Toptal blog, but they’ve given me permission to repost it here. Enjoy! The beginning of a new project: Your client needs help with a redesign of its website or application. Here is the good news: Your client is aware of User Experience (UX), cares about customers’ needs and sees the value in investing in a great user experience. They asked for an expert with UX skills to help, but do theyreally understand what it means to deliver an exceptional user experience? User research is a vital component of UX design. Don’t let anyone tell you otherwise. UX is more than a bunch of rules and heuristics that you follow in your product design process. UX is subjective, as the name suggests. It is the (subjective) experience that a user gets while using a product. Therefore, we have to understand the needs and goals of potential users (and those are unique for each product), their tasks, and context. As a UX expert you should already be familiar with the maxim, It all starts with knowing the user. Now for some bad news; this is the point when you discover your client’s misconceptions about UX. In this post I will try to explain why, and hopefully, help fellow UX specialists in their efforts to convince clients that good UX is next to impossible if it is not preceded by good user research. You cannot create a great user experience if you don’t know your users or their needs. Don’t let anyone tell you differently. Don’t simply accept the common argument that there is no time or money to do any user research for your project. User research should shape your product design and define guidelines that will enable you to make the right UX decisions. User research will shape your product; it will define the guidelines for creating a product with a good experience. Not spending any time on research, and basing all of your design decisions on best guesses and assumptions, puts you at risk of not meeting your user needs. Skipping user research will often result in “featurities,” decisions that are driven by technical possibilities and not filtered by user goals. This leads to things such as overly complex dashboards in cars, where the user’s focus should be on driving, not on figuring out how to navigate an elaborate infotainment system. Many users find automotive infotainment systems overly complex and distracting. Identifying the target audience is crucial to good UX design. 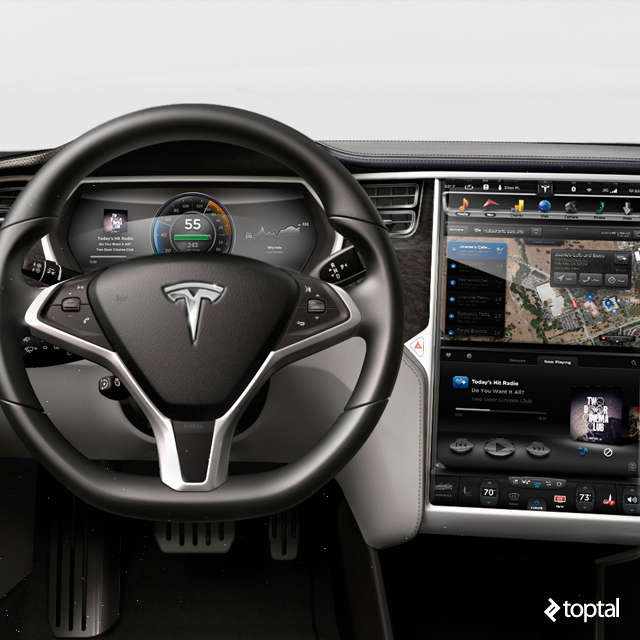 Tesla’s cutting edge infotainment system, based on Nvidia Tegra hardware, employs two oversized displays, one of which replaces traditional dials, while the other one replaces the center console. Yes, it looks good, but it was designed with tech savvy users in mind. In other words, geeks will love it, but it’s clearly not for everyone. It works for Tesla and its target audience, but don’t expect to see such solutions in low-cost vehicles designed with different people in mind. 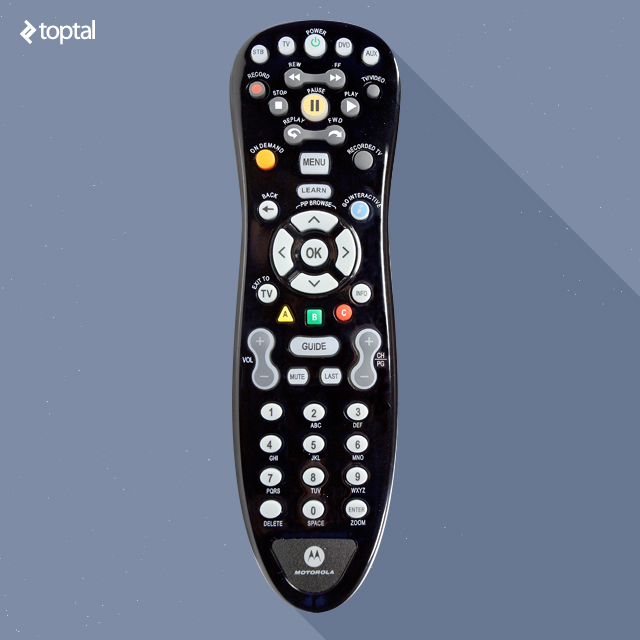 Poorly designed remote controls are not intuitive, so casual users tend find them overwhelming, resulting in a frustrating user experience. Old remote controls are another example of hit and miss UX. There is little in the way of standardization, so each one takes time getting used to. But what about the purely digital user experience? Too many fields in a form, or too much information may overwhelm and drive your users away. Poorly designed digital interfaces can drive users away. Even if they don’t, they will annoy users and feel like a waste time. Instead of creating the opposite behaviour, poorly designed and implemented interfaces are more likely to scare off potential users. Quality user research requires time and resources. However, you can start by using existing information to get a sense of what your users need. Let’s take a closer look at each of these sources. 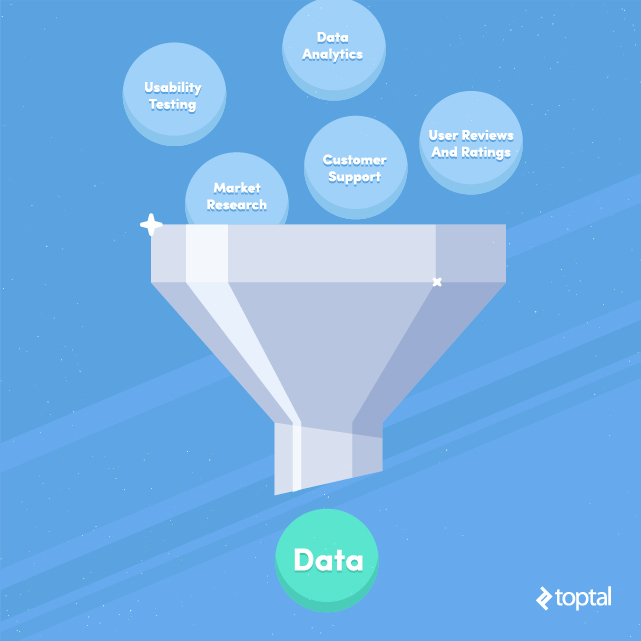 If you are working with an existing product, your client might have some data and insights about its use. Data analytics assist with getting a good overview about general usage: How many visitors are coming to the website, what pages are most visited, where do visitors come from, when do they leave, how much time do they spend where, and so on. But here is what this data is not telling you: How does the experience feel? What do users think about your service, and why are they spending time on your website? Why do they leave? For example, your data indicates that users are spending a lot of time on a specific page. What it doesn’t tell you is why. It might be because the content is so interesting, which means users found what they were looking for. On the other hand, it could be an indication that users are looking for something they cannot find. Data Analytics is a good starting point, but it needs further qualitative data to support the interpretation of the statistics. Your client’s product might have received some user feedback, already. There might be a section for feedback or ratings on the website itself, but external sources may be available as well. People might have talked about it in blog posts or discussion boards, users may have given app reviews in an app store. Check different sources to see what users are saying. However, be aware of limitations. People tend to leave reviews and ratings about negative experiences. Don’t take this as a reason to shy away from user reviews or to ignore feedback! Check whether any action has been taken on negative comments. Compare the timing of negative comments to releases and changelogs. Even great apps can suffer from poor updates, leading to a lot of negative comments in the days following the update. Do your best to weed out baseless comments posted by trolls. What are users saying about the competition? Identify positive and negative differentiators. Don’t place too much trust in “professional and independent” reviews because they can be anything but professional and independent. 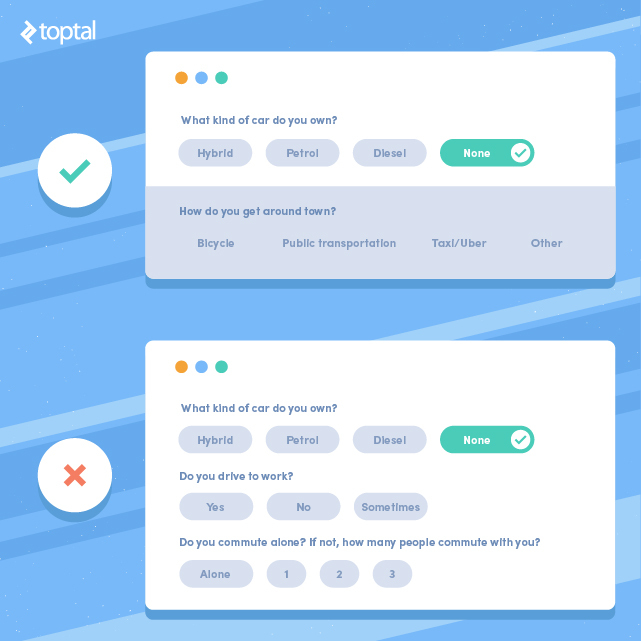 User reviews are a good source for collecting information on recurrent problems and frustrations, but they won’t give you an entirely objective view of what users think about your product. Your client might have a customer support hotline or salespeople who are in touch with the user base. This is a good resource to get a better understanding of what customers are struggling with, what kind of questions they have, what features/functionality they are missing. Setting up a couple of quick interviews with call center agents, and even shadowing some of their calls, will allow you to collect helpful data without investing too much time or money. Customer support provides you with a good opportunity to learn about potential areas for improvement, but you will have to dive in deeper to get detailed information about problems. Your client may have some basic information about the customer base, such as accurate demographic information, or a good understanding of different market segments. This information is valuable to understand some of the factors behind the buying decision. It does not offer any information about the usage of the product, though. Market research is a good source of information if you need a better understanding of how your client thinks, what their marketing goals are, and what their market looks like. However, it won’t reveal all relevant details about user goals or needs. If you are lucky, your client might have done some usability tests and gained insights about what users like or dislike about the product. This data will help you understand how people are using the product and what the current experience looks like. It is not quantitative research, and therefore you won’t get any numbers and statistics, but it helps you identify major problems, and gives you a better understanding about how your user group thinks. There is also the option to do some quick remote testing session by using services such as usertesting.com. Usability tests are another good way of identifying key problem areas in a product. The budget might be small and the timeline tight, but ignoring user research will eventually bite you. Help your clients avoid pitfalls by making them aware of the benefits of user research. 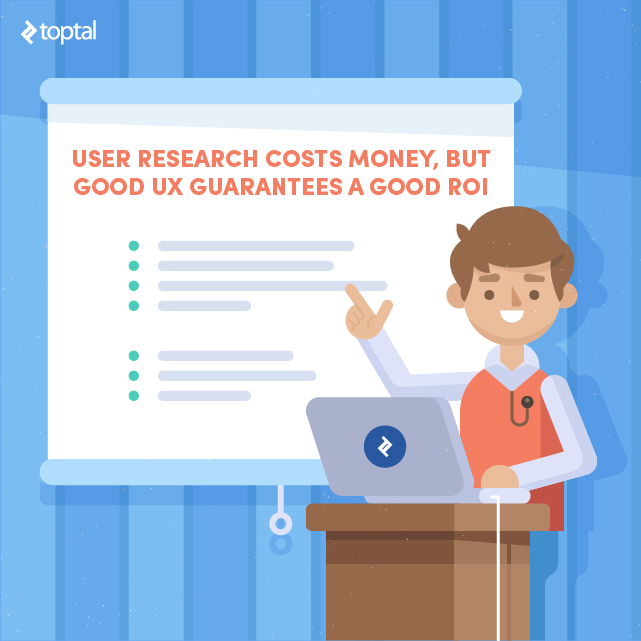 What’s the ROI of good user experience? 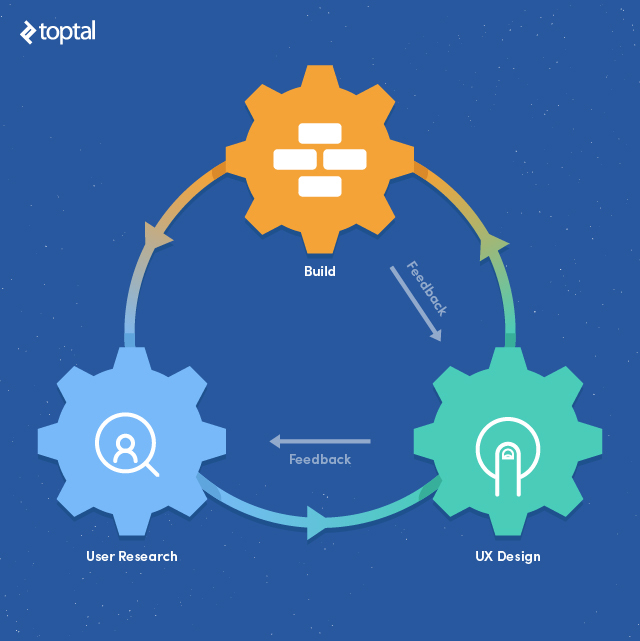 Knowledgeable UX experts must be able to communicate the value of user research to clients. As a UX designer, you need to view user research as part of your toolkit, just like a hammer or saw for a craftsman. It helps you to apply your expertise in practice. No matter how much expertise you have as a designer, there is no generic solution for every problem. The solutions always depend on the user group and the environment, so they need to be defined and understood for every product. User research will help get an unbiased view, to learn about users’ natural language, their knowledge and mental models, their life context. 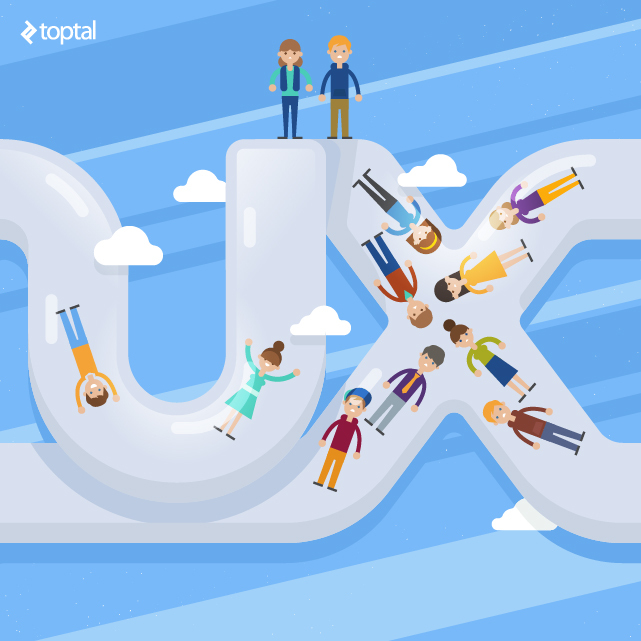 You are the UX design expert, but you are not the user. Best practices originate from design decisions in a specific context; the digital industry is evolving at a rapid pace, design trends and recommendations change constantly, there is no fixed book of rules. We need to be able to adjust and adapt. Those decision should be made based on research, not practices employed by others, on different projects. Invite your client to a user needs discovery session to observe how users are using the product. Start with small tests and use remote usability testing tools such as usertesting.com to get some quick insights and videos of users in action. The outcome might be a user journey map or a user task flow. Aim for a visualized document that identifies outstanding questions so you can define areas that need more research. Personas are a good tool for making your target group more tangible, and for becoming aware of different needs, key task flows and and how that might vary for different groups. It’s the common ground and a good starting point. However, to redesign a product you need a better understanding of the usage. You need to know how people work with your product, what they do with it, when they get frustrated. Ask for further details about user stories and task flows to make use of personas. The above list of sources for information about user behaviour should give you a good starting point for sharing ideas with your client on how to gain user information on a (very) tight budget. Make your client aware of the risks if product design decisions are made without a good understanding of the user. User experience is still a bit of a “mystery” in many circles: Everybody talks about it yet it is hard to define, as a good experience is in the eye of every user. It is, therefore, key to gaining a sound understanding of the context, the user goals, and the thinking necessary for designing a truly exceptional user experience. The more transparent you are with your work process, the better your client will understand your tools and the information you need to make good decisions. While some clients may not be open to the idea of using additional resources on research, it’s necessary for experience specialists to explain the value of user research, and to argue for further research when necessary. To accomplish this, UX designers will require negotiating skills to make their case. Luckily, proper user research is beneficial to clients and UX designers, so convincing clients to divert more resources towards research should be feasible in most situations. Reluctant clients may be swayed if you manage to devise a cost-effective user-research method, and I hope some of the tips and resources in this article will help boost user research, even if money is tight. Entrepreneur First is a program that operates under the theory that if you take a bunch of talented individuals, offer them mentoring and guidance and a small stipend to live off of, they will end up creating brilliant businesses. It appears that their theory is working quite well. Tell us a bit more about the most impressive technical thing you’ve built. Why do you think it’s impressive? Tell us about a time when you’ve been relentless to achieve something you wanted. How did you do this? What do you think you would like to work on at EF? What skills do you have to build this? I was very happy with my video, which I created quite easily, just using iMovie for iPhone. Check it out below! Sadly I wasn’t selected to proceed to the next round of the application process but I understand- I don’t have any entrepreneurial experience; not yet at least! But I did enjoy learning about EF and creating this video and I think it really showcases my tenacity when it comes to making things happen. Alberta Science Network (ASN) is a charity that is very close to my heart. They have several educational initiatives, including “Scientists And Engineers in the Classroom”. Through this program, from 2011 to 2015, I made over 40 presentations at local schools, teaching over 1500 students about Chemistry using magic and hands-on activities. Here’s a quick video I whipped up when ASN wanted their volunteers to talk about what they do for the organization. ASN approached me asking if I knew of any technologies or people who could help smooth out some of their processes. I initially declined because it was a busy time at work, but later approached the organization to see if I could help out. 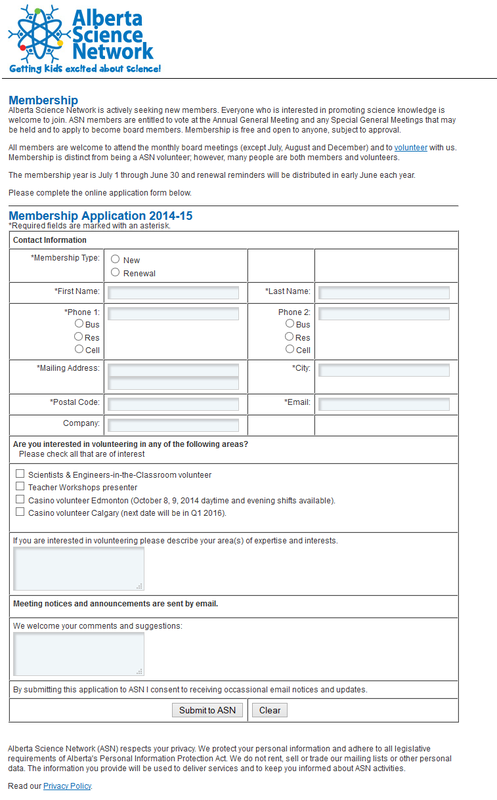 Here’s a screenshot of the member form that was in use originally. This is quite a labor-intensive process for staff, the data is not backed up, and it does not make it easy for members to renew. As you can see below, the form was remade using Google Forms. The look and feel wasn’t significantly changed but a few unnecessary fields were removed and the fields were aligned and spaced further apart from each other. Going into the project with ASN, I was hoping to be able to use Ruby on Rails (RoR) to make a custom solution because I had recently done the fantastic Rails Tutorial by Michael Hartl. After considering RoR and looking into Customer Relationship Management tools such as the open-source platform CiviCRM, I realized that Google Forms and Sheets could do the trick in considerably less time. Google automatically inserts form data into a spreadsheet, but there were a few things that weren’t automatically supported. For example, ASN has annual memberships, so every June, a script goes through and sets all members to inactive then invites them to renew their membership. In order to improve the renewal rate, I used the following script to pre-fill the membership form for these renewal emails. * Note: This script can either be run manually or linked to a trigger such as a time-based trigger. // Grab column numbers for later use. // Skip headers, then build URLs for each row in this sheet. // Only update for active members. // Create a form response object to prefill. // Cycle through all form items that have matching columns. // Helper function that returns the size of an object.